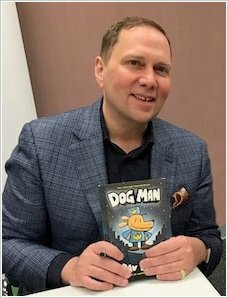 Author and illustrator Dav Pilkey started writing the Captain Underpants stories while he was still at school. His books contain scenes which may be too silly for grown-ups, small animals and some types of houseplants. If you are a grown-up, a small animal, a houseplant or a teacher, you should seek permission from a kid before reading on! He is also the author of two series for younger children, Ricky Ricotta and Super Diaper Baby. He lives in Washington State, USA with his wife.